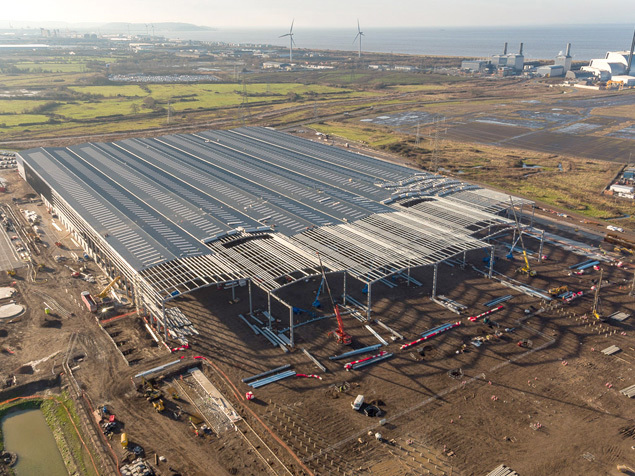 Central Park in Avonmouth has experienced an unprecedented year of activity as the region’s largest ever distribution warehouse – the 1.2 million sq ft building for The Range – begins to take shape on land acquired there earlier in the year. New aerial pictures have revealed the true enormity of the construction. Built on 55 acres, The Range is constructing the single footprint unit as its new South of England distribution centre. The centre will support the store’s growth and is expected to bring more than 1,050 new jobs to the area. Construction will be complete later in spring 2017. Central Park is one of the largest distribution development projects in the UK, situated alongside the M49 at Avonmouth. Since January 2016, the developers, Delta Properties, advised by Bristol property consultants GVA and Knight Frank, have signed up new logistics deals totalling nearly 2.45 million sq ft on 121 acres. Alongside The Range, Lidl acquired 33 acres of land to build 600,000 sq ft at Central Park in 2016 and have just started construction; Mountpark acquired land for a 410,000 sq ft three unit speculative scheme, and most recently, Davies Turner Logistics acquired land for a 260,000 sq ft distribution centre. But 100 acres of immediately developable land remains available. Paul Hobbs added: “Central Park benefits from a unique planning permission which allows immediate development of B8 – that is, storage and distribution space. “Together with the commitment of Delta Properties to invest in a major road, rail and utility infrastructure, this has resulted in a distribution hub of national significance which continues to attract major occupiers such as The Range. “Plans for the new M49 junction promoted in support with the LEP, coming straight into Central Park, are almost finalised and will further enhance the scheme and lead to further growth. The new projects under development will provide 2,500 new jobs to the Severnside/Avonmouth Enterprise Area in addition to construction jobs. Abdul Choudhury, economic development Officer at South Gloucestershire Council said: “Prospective occupiers (both foreign and domestic) are looking to address changes in consumer shopping habits through hub and spoke distribution centres and are reacting to evolving regulations about HGV driving times. Paul Hobbs said: “We’re expecting 2016 to end on a high for industrial take-up in Bristol. The first six months of the year recorded a massive 3.217 m sq ft and 48.36 acres of development land – that is only 1 per cent off the whole of grade A industrial take-up in the core East Midlands hotspot. In contrast, the take-up for the whole of 2015 was 2.6 million sq ft.
“With record take-up, the declining supply of high quality space in the last 12 months has led to virtually no prime standing stock available at all, which is a common factor across most of the UK industrial markets. “As a result, we are seeing the return of significant speculative industrial development with activity at several locations. Tim Davies, of Colliers International, said: “The Avonmouth region is ideally situated for distribution and with first class rail, road and sea connectivity the location has all the key criteria for a top class intermodal facility. Moreover, there is plenty of vacant land ‘oven ready’ for new development. The importance of the location as a natural distribution hub has been recognised by many global companies who have developed huge facilities in the area.